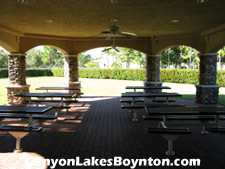 The Canyon Lakes community clubhouse offers homeowners and their friends and family a meeting place suitable for everyone - from the kids to thegrandparents and everyone in between. The extravagant clubhouse features a fully equipped cardio room and fitness center, as well as a fun-filled activity center that provides hours of entertainment for children. The large social hall with the capability of hosting special occasions and large events. 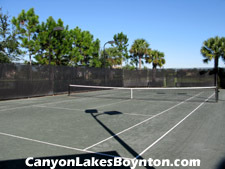 Residents can enjoy the great outdoor weather using the two tennis courts, the full-size basketball court and an open playing field perfect for games like soccer, football or baseball. Those who love to walk, skate, bike or run will have the benefit of the scenic trails that will provide the perfect place for daily exercise and fresh air. 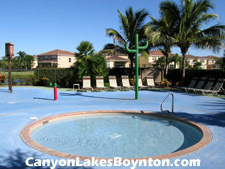 To cool down on those hot days, residents can use the resort-style swimming pool, a wading pool and an aqua tot lot with water spray stations. 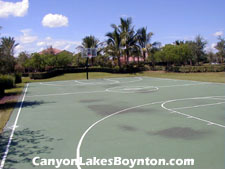 A covered tot lot and nearby shaded pavilions will offer yet another convenience for entertaining family and friends.